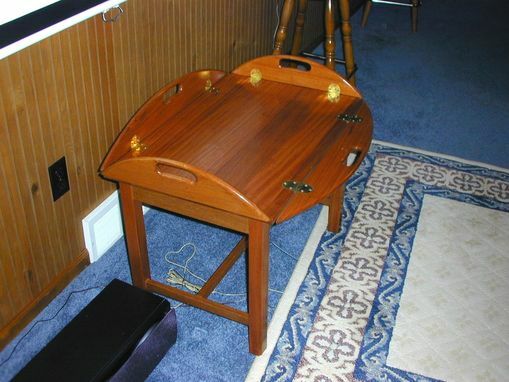 Made from genuine mahogany, this butler tray table with the sides folded up, sits on a stand and can be used to serve drinks and snacks. With the sides folded down, it can be used as a coffee or snack table. The hinges lock in the upright position but release to allow the four sides to lay flat. 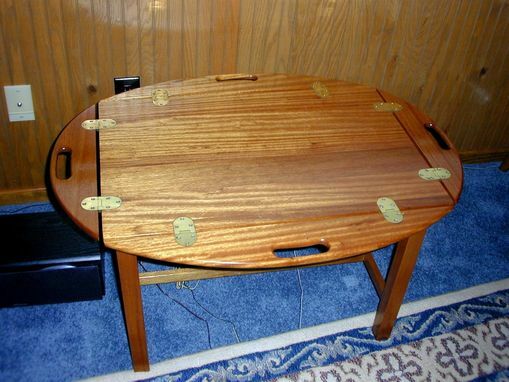 The butler tray table was give two (2) coats of a high gloss polyurethane and the hand rubbed with liquid wax. Dimensions: Approximately 24" wide x 36" long x 20" tall.